1. First of all, I finally managed to stay on point with the blog schedule overcoming all the hurdles and now I know how much being consistent on the blog pays off. Because I had my internals in the mid of September, I decided to bank some posts so that I don't have to struggle with again being irregular. It worked so well for me and so this is what I am going to do for every month that I blog. It just makes it so easy and the whole process is a lot less tiresome. 2. I aced all my internals which is another goal checked off my list. Internals are the easiest way to get the upper hand on your over all score and so it is really important to score as much as possible. I know this is a lifestyle blog but hey a little educational tip doesn't hurt anyone. 3. This is also the month where I was the most consistent about my fitness journey. I have never been this serious about it before but I guess losing my breath over just a couple of flight of stairs was a real wake up call. One confession is that I haven't been able to gain control over my eating habits so I can't see a major difference in my weight but this is a major goal I have in my mind for October. 4. One of the most happiest moments for me was when I hit a 100 followers on Twitter. It does not mean that I believe in a number game but I still consider it a milestone for my blogging journey. It's like a payday when you finally get the worth of all your hard work. A bit sentimental but I guess that's how I would describe the feeling. 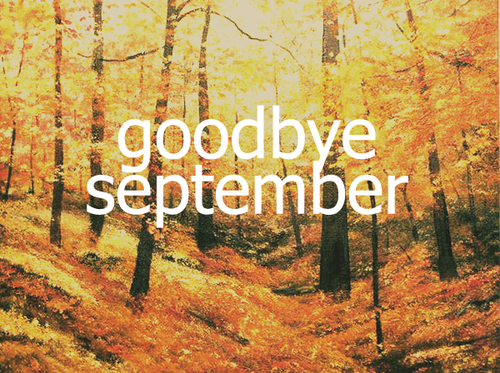 I am so happy with the way September turned out and I am so excited about October to start. What were your special moments this past month?